Vadas are a traditional South Indian snack made with lentils, potato, or gram flour, shaped into doughtnuts or flat discs, and deep fried. Parippu vadas are made with tuvar dal (split pigeon peas), but I have made these with chana dal (split chickpeas) - kind of like an Indian-version of a falafel. 3/4 cup of bengal gram dal - wash and soak for 3 hours. Mix everything together with salt to taste (add salt either while grinding or now). Mix, shape into flat...umm..flat shapes...:P I keep them on a grease-proof paper so it's easier to take it off and fry. TBS Olive Body Butter - all-over body moisturiser with olive oil that helps condition, soften, and smooth the skin and prevent dryness. It is body butter, though, and can be greasy, so don't pick this up unless your skin is really dry. It has a very mild fragrance, at least compared to some of the other TBS body butters that I have tried, but it did seem a bit plasticky to me - not really something that bothers me, though. If you are having problems with dry skin, I would definitely recommend this. Best used immediately after a bath when the skin is still damp - helps seal in the moisture, you need lesser of the product, and it gets absorbed much faster. I have never been a big fan of sunscreens/sunblocks - they made me oily and only added to the usual acne - and I figured I would rather be dark and tanned than spotted! A visit to the Clinique counter changed my mind. I know every skincare brand would tell you to use a sunscreen, but what was different with Clinique was that their moisturizer (Dramatically Different Moisturizing Gel) was just that - dramatically different, in a good way. Clinique claims: Invisible high-level UVA/UVB shield helps prevent dark spots and imperfections. Clinique's proprietary melanin-dispersion formula with Black Out Yeast Extract adds a whitening boost. Oil-free. Lightweight. Wear as makeup primer or alone. My experience with the product: First thing, this product looks like a tinted moisturizer. It's light brown in colour - like any tinted moisturizer would be. Clinique does not specifically state this, and really, it did not make any difference to me, but just in case you buy this online or without trying it at a store - this is not white or creamy in colour. The product is easy to spread. I use a moisturizer first, then dot this product over my face and blend it in. I wait about 15-20 minutes before I apply any other product over this or even step out. As you can see from the photos, the skin seems a little shiny after applying this. After some time, as this gets absorbed better by the skin, this shine gets greatly reduced. I just apply my powder foundation over this and that sorts out any remaining shine. This is an oil-free product, but it does give a little shine to the face - which can be easily managed with any powder. If applied in excess, in darker skin tones, it can leave a whitish cast. I am pretty dark, and I don't usually get a white cast, so I think normally that should not be a problem. Perfect for oily-skinned girls or the acne-prone - it never ever broke me out. Clinique Super City Blocks are marketed for those stuck in the city where pollution levels tend to be high. These act as barriers to the smoke and grime along with providing sun protection. I don't use this on a daily basis, so I really cannot comment on how effective this range is at reducing existing imperfections. I have not got any new break-outs with using this, though, which is never the case with me and sunscreens! Clinique claims this works as a primer - I guess it does, but I have never tested to see if my foundation lasts longer over this. It does allow for a bit more smoother application of foundation. This comes packaged in a tube. Although pretty leak proof and safe to carry in the bag, the opaque tube makes it difficult to tell how much of the product is left. Another thing, it is a bit runny, so you have to be careful how much you squeeze out. It is easy to take out too much and the tube does get messy near the cap area over time. My only gripe with this product - I was told by an SA at Clinique that it has been discontinued. I am not sure if this is true, but if yes, then I really don't know what to say! I love this product, and I really wish Clinique continues to sell this in India. Cost: About Rs. 1500 (I bought this a long time back, and I don't remember the exact cost). Not that I am that great with makeup anyway, but with summer fast approaching, I can happily go around with hardly any makeup and blame it on the heat (for winters, I have to think of some excuse :P). These are my favorites for this summer. and a barely there peach sheen. What are your must-have makeup products for the summers? TBS Deep Sleep Soothing Shower Cream (Body Wash) - with relaxing ingredients of jujube date, hops, milk protein, and Community Trade camomile and cocoa butter for restful sleep and silky soft skin. I picked The Body Shop Deep Sleep Soothing Shower Cream because of the "Deep Sleep" tag. I find it a little difficult falling asleep (except if I am working), so I thought this would be a great product for me to try out. TBS claims it "promotes restful sleep" and recommends using this at bedtime. The Deep Sleep Soothing Shower Cream is a creamy white and lotion-like in consistency with a sharp citrusy smell to it. The bottle has a flip-open cap, and it needs a bit of an effort to squeeze out the product, not because of its consistency but because the bottle itself is a bit hard. Other than that, I think it's pretty sturdy packaging with no chances of leakage. I really couldn't find any difference in my sleep after using this, so that claim, at least for me, is really just a claim. I have not used it in combination with any other product from this range, so that might be one reason it didn't make me any sleepier! That apart, I love this shower cream because it does not dry out my skin at all. I use this with the TBS bath gloves, and the lather is not too much. It is also much easier to wash off than most shower gels I have tried (though this is the first time I am trying a shower cream). It leaves my skin clean but does not dry it out - just perfect for my dry skin. The smell is a bit strong, but I personally don't have any problem with it. Aqua, Sodium Laureth Sulfate, Cocamidopropyl Betaine, Styrene/Acrylates Copolymer, Glycerin, Glucose, PEG-18 Glyceryl Oleate/Cocoate, Sodium Chloride, Acrylates Copolymer, Limonene, PEG-40 Hydrogenated Castor Oil, Trideceth-9, Sodium Cocoa Butter Amphoacetate, Hydrolyzed Oats, Helianthus Annuus Seed Oil, Hydrolyzed Milk Protein, Citrus Aurantium Dulcis Oil, Sodium Hydroxide, Prunus RDulcis Oil, Propylene Glycol, Citrus Medica Limonum Oil, Linalool, Disodium EDTA, Citric Acid, Lavandula Hybrida Oil, Humulus lupulus, Anthemis Nobilis Oil, C11-15 Pareth-40, C11-15 Pareth-7, Citrus Aurantium Amara Oil, Zizyphus jujuba, Glucose Oxidase, Lactoperoxidase. Overall, I liked this shower cream. A bit pricey, but if you have dry skin, do give this a try, especially if it's on discount. Lakme Fruit Blast Berrylicious Fruit Revitalizing Scrub Mask: With the goodness of raspberry, figs, and oats - Lakme claims this unique 2-in-1 scrub-mask deep cleans, polishes, and moisturizes your skin, all in one go. Oat proteins leave a protective barrier on the skin, which prevents moisture from leaving it keeping your skin hydrated and nourished. Figs maintain the moisture balance in your skin while preventing acne and pimples. The soft, velvety texture of natural clay and minerals detoxify your skin, while sprinkles of oat extracts and wax beads cleanse away excess oil. The enigmatic blend of raspberry and fig extracts softens and nourishes your skin. Though I had heard a lot about this mask, I never did actually get to see it outside of the internet until very recently. Since this is a clay-based mask, I guess it's a good thing I bought this just when summer is starting. The packaging is the usual tube but no flip-open cap on this one. No complaints with the packaging except it looks just the same as the face wash and is easy to mistake one for the other. Lakme, however, seems to have solved that problem (at least in my case) by ensuring that only the face wash was available anywhere I searched - no way I would mix up the two products - brilliant strategy! On to the product itself, it is a thick paste that spreads easily enough and is a bright pink colour that reminds me of Gelusil. I suppose the intention was to give it a very fruity colour - maybe a raspberry puree (?) - but I am pretty sure the colour comes from some artificial colouring agent, and it won't hurt to go a little light on that. 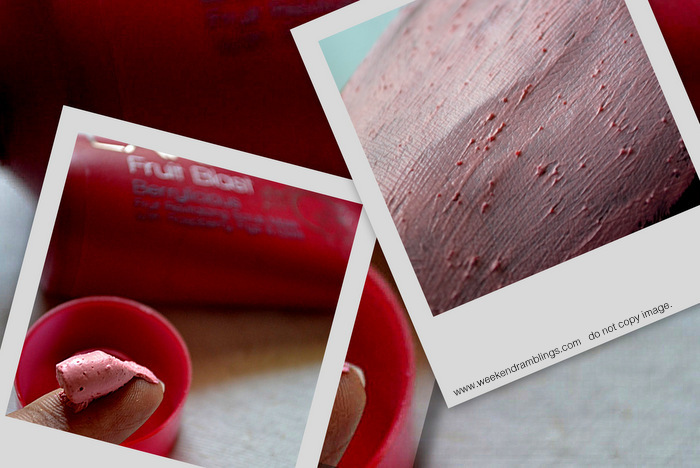 There are very small wax beads in it that you can feel while spreading the product. How to Use/Ingredients: Contains parabens and DMDM Hydantoin (2 preservatives I could identify). My Experience with the Lakme Fruit Blast Berrylicious Fruit Revitalizing Scrub Mask: I use this exactly as directed - leave it on for about 15 minutes by which time it dries. It is fairly easy to apply and spreads smoothly. I scrub while washing away the mask and the wax beads do a pretty good job of scrubbing. It has a slight soapy feeling while washing off though no lather (not that I checked). This leaves my skin clean but not dry. Though Lakme attributes this to the few natural ingredients toward the end of the list, I think it's most because of the glycerin and hydrogenated castor oil towards the top of the ingredient list. Anyway, it does not dry my skin out, but does not leave it oily either. I use a moisturizer following this, and I have not had any breakouts. The scrubbing power of the mask is due to the wax beads (Lakme also says oat extracts but I am ??) - these are very small, and it is very easy to make the mistake of overscrubbing. Do not underestimate the power of these teeny beads! You would never realize it because the beads seem so harmless, but later you would notice that the skin seems red. You need to use just enough pressure to just slide these beads over your skin - as lightly as possible. It left my skin clean, but I don't have blackheads so cannot comment on that. I think it does a fairly good job of absorbing any excess oil - but in my opinion more suitable for oily-combination or even normal skins than the oily-skin girls. I did not have any sensitivity or burning with this, but this is one thing I hesitate to comment on because there is a long list of ingredients, and skin reactions can be quite varied from person to person - check ingredient list. It has a faint fruity smell that I don't really notice now. Overall, a good 2-in-1 scrub-mask. If you have oily-combination or normal skin, do give this a try. Does not dry out skin excessively or make it too oily. I didn't find it very easily available in the market, so that would be a minus point for this. Vaseline Total Moisture 24-Hour moisturizing cream with milk, honey, vitamin E, and glycerin: Any winter problem - one 24-hour solution. Impressive claims, but the only reason I picked this up is because I found a small 20 g tube. Available in a variety of sizes, I have seen these sold in sachets and larger tubes, I find this an ideal cream to carry around in the bag. Not too sure of the sachet packaging, but the tube is quite leak proof. The product itself is a thick-looking cream that is actually quite soft and easy to spread. It is quite greasy, but that disappears after a while. I find this a bit too greasy to use as an all-over body cream, but for dry areas like my hands or elbows this is quite good. For the claims of 24-hour moisture, at least on me, it does not deliver. About morning to evening, is what I got. Especially on my hands, I really do need to reapply 2-3 times a day at least, but that is mostly because my hands get a lot of water on them. Overall experience: It gives decent moisturization, but I would not call this a replacement for my regular home-use cream. It's strictly for the bag/car/office only - a temporary solution. I find this a bit too greasy, though only for a while before it gets absorbed (or transferred on to my face :P). For use as an all-over body cream, even if I do get past the initial greasiness, I think I would use up the product awfully fast. It still leaves the cuticles dry, though!! Repurchase: Yes, once I run out of my other hand creams. I love this cream for the simple fact that it is perfect to carry around in the bag. Availability in a variety of sizes is definitely it's big plus point (for me) - plus it's not too expensive. And I like the faint pleasant smell. Got a couple of things from my sister - she didn't need them, and I was happy to adopt - Ayur Herbal All-Purpose Cream was one of them. What Ayur says: Easily absorbable and rejuvenating cream. It preserves the skin by increasing the blood circulation. Tightens skin and prevents dehydration of skin, due to high concentration of natural moisturiser. Though marketed as a face cream, I tried it as a body cream, and it works just fine. It's a light, easy-to-spread cream, that gets absorbed in a jiffy and doesn't feel too heavy. Cost: Rs. 85/200 mL. This would last me a long while - and considering it provides decent moisturization, I found this quite a plus point. Available in 3 sizes: 80 mL, 200 mL, 500 mL - so you can always get a smaller size to try out. It spreads very easily, neither too thick nor too runny, and the moisturization lasted the whole day. I didn't find it too greasy or oily - was just enough to provide moisture without being too heavy. What I didn't like about it: No ingredient list! I resent the "key ingredients" that so many companies seem to think is sufficient for a list, but Ayur has not even bothered with that. Other than the vague terms on the label, there is no mention of anything that goes into the cream. This has a very old-fashioned cold cream smell to it - I really don't find this a problem at all, and it doesn't even smell much on the skin. Though I found this a very decent body moisturizer, it is not a very effective foot/hand cream. I definitely need something more nourishing for the hands/feet. Mulakushyam is a mildly spiced curry made with vegetables such as pumpkin, spinach, squash, gourds, etc. (any one of them, usually, and not all together), cooked with lentils and coconut paste. I have modified the traditional mulakushyam recipe - done most of the cooking in the microwave and used coconut milk instead of fresh coconut paste. It tastes a bit different from the usual version but is much easier to make and would work if you have no access to fresh coconuts and/or a blender. Mix in a microwave safe bowl and cover and cook on 100% power for 10 minutes - time it takes for the pumpkin to cook. Make sure there is enough water for the pumpkin to cook but not much excess. Add about 1 tsp of salt (or to taste) after this step. Spiced and ready to go into the microwave. 10 minutes later - cooked with hardly any water remaining. 1 cup of thick coconut milk. Add the spice powders and the coconut milk to the cooked lentil and pumpkin mixture. Mix, cook for about 3-5 minutes. The mixture should come to a boil. Step III: All that is left to do is a tadka - tempering with oil, dried red chili, mustard seeds, and curry leaves. Heat about 2 tsp oil (I use coconut oil - can substitute with sunflower or canola oil). Add 1/2 tsp mustard seeds. Soon as they start spluttering, add dried red chilies and curry leaves. Add this to the cooked curry, stir it in. Serve with rice.